Are you looking for a great gift idea for someone special? Perhaps an upcoming birthday, wedding, graduation or anniversary, then why not hire Christine Beasley to sing. If you can provide a piano on-site, then Christine has a pianist available as well. Personally handwritten Gift Voucher Cards for Singing Lessons are also available – give one lesson or really “surprise’ with a loving Term of 10 lessons with a resume included about my achievements as an Opera Singer. Do you have one of Christine’s CDs? For only $15.00 plus postage, while stocks last, then you can enjoy yourself, or present to a friend. For more information, contact Christine. If anybody is thinking of joining Christine Beasley Singing studio, you couldn't go wrong. Christine is caring, wonderful and approachable person and it shows by the way she teaches you. All of her students wanted a word with Christine, I was a witness, to speak to her or take photos with Christine. I believe Christine received lots of presents and flowers from her students, how loverly. The end of year concert is just a showcase for family and friends. Showing how hard the students work and how dedicated Christine is to her students. Abira and I just want to express our sincere appreciation and thanks to an amazing singing teacher and valued friend. A very big thanks Christine! Abira has been happily singing every moment she can with so much confidence since you embraced her passion with such support and encouragement. With your guidance, Abira's carefree love for singing has blossomed into a true appreciation of the art of singing. Thank you from both of us. It is a privilege and a pleasure to have Christine as my singing teacher. She is a loving, caring, understanding and fantastic teacher. It is a great blessing to be taught by a true professional in this field. More than a wonderful teacher, she has grown to become a dear friend. I appreciate her techniques and especially her patience, passion and continuous encouragement. She has the ability to bring out the best in her students. My singing experience with Christine is lots of fun. She is an awesome inspiration. I was impressed by Christine Beasley, adjudicator of the vocal sections. My daughter did very well in this area; however I hope this isn't the reason I am saying this. Ms Beasley was so encouraging and generous to all competitors and was able to speak with authority about the challenges and difficulties young singers face. She clearly had vivid memories of her own experiences and was able to draw upon these and to communicate these to the audience and singers very effectively. Her comments were also very tactful and thoughtful; not all adjudicators share this very important trait! Christine was a real 'find' as an adjudicator and I hope she will be able to return to Nowra somewhere down the track. Christine Beasley was my first singing teacher! Articulate and passionate about singing, no genre or ability is too difficult to tackle. Her own foundations as an Opera singer in Germany and the UK together with a distinguished career with Opera Australia give Christine a unique intuition when working with her students and strong knowledge of repertoire. You will leave her lessons with a better technique, and stronger understanding of performance practise. Christine is a Mentor who I value very much and am grateful to for nurturing my talent from the start. Christine Beasley is a vibrant, articulate and passionate teacher with an extensive knowledge of a variety of musical genre. 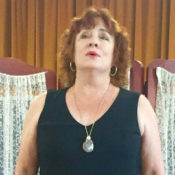 She has enabled me to expand my vocal range and strengthen my vocal abilities through adopting a good singing and breathe support techniques. I have enjoyed having singing sessions with Christine for the past two years, during which time I have developed a rich and diverse repertoire of classical and contemporary musical work. I look forward to having more singing sessions with Christine in 2014 as I have found them to be truly enjoyable & inspiring! Singing is just not opening your mouth and producing sound, it is being taught a solid vocal technique together with understanding what you are doing and the story that you are telling. In the four years I have been with Christine she has taught me been both of these principles and as a result I have enjoyed much success and received many compliments as a performer. An excellent teacher whom I would highly recommend.